C. S. Lewis was a prolific letter writer, and his personal correspondence reveals much of his private life, reflections, friendships, and the progress of his thought. This second of a three-volume collection contains the letters Lewis wrote after his conversion to Christianity, as he began a lifetime of serious writing. Lewis corresponded with many of the twentieth century's major literary figures, including J. R. R. Tolkien and Dorothy Sayers. 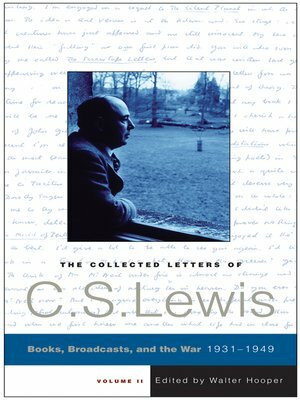 Here we encounter a surge of letters in response to a new audience of laypeople who wrote to him after the great success of his BBC radio broadcasts during World War II — talks that would ultimately become his masterwork, Mere Christianity. Volume II begins with C. S. Lewis writing his first major work of literary history, The Allegory of Love, which established him as a scholar with imaginative power. These letters trace his creative journey and recount his new circle of friends, "The Inklings," who meet regularly to share their writing. Tolkien reads aloud chapters of his unfinished The Lord of the Rings, while Lewis shares portions of his first novel, Out of the Silent Planet. Lewis's weekly letters to his brother, Warnie, away serving in the army during World War II, lead him to begin writing his first spiritual work, The Problem of Pain. After the serialization of The Screwtape Letters, the director of religious broadcasting at the BBC approached Lewis and the "Mere Christianity" talks were born. With his new broadcasting career, Lewis was inundated with letters from all over the world. His faithful, thoughtful responses to numerous questions reveal the clarity and wisdom of his theological and intellectual beliefs. Volume II includes Lewis's correspondence with great writers such as Owen Barfield, Arthur C. Clarke, Sheldon Vanauken, and Dom Bede Griffiths. The letters address many of Lewis's interests — theology, literary criticism, poetry, fantasy, and children's stories — as well as reveal his relation ships with close friends and family. But what is apparent throughout this volume is how this quiet bachelor professor in England touched the lives of many through an amazing discipline of personal correspondence. Walter Hooper's insightful notes and compre hensive biographical appendix of the correspon dents make this an irreplaceable reference for those curious about the life and work of one of the most creative minds of the modern era.